The Toxicologist Today: Bay Leaf, is it toxic or what? Bay Leaf, is it toxic or what? One of the greatest myths I have faced through my whole life was having my mother shouting at me the great dangers associated to bay leaf. Yeah, exactly, that innocent cooking leaf that adds some good flavour to our tasty cuisine! Nevertheless, I was told by her that it was dangerous, but never really got to understand the reason why it was so intensively labeled as such a liability, to cook whit it, to have it as a "tool" for a touch of rural "glamour" to our food. So, as a dedicated Toxicologist I had to undergo a fierce research towards the source of such theory. Is it really true that bay leaf can be toxic? And if so, how toxic? And toxic to what biochemical level? For starters, I needed to fundament all my achievements and acquired information on proper scientific papers/websites rather than just Wikipedia cheap chat talk. Thus, I searched a few articles and found these pieces of amazing info concerning "Radical Scavenging Activity and Antioxidant Capacity of Bay Leaf Extracts", Elmastas et al., 2006 - an article issued on the Journal of Iranian Chemical Society; an article on "Isolation and identification of cytotoxic compounds from Bay leaf (Laurus nobilis)" from Fang et al., 2005; and a website regarding organoleptics. Going through these amazing articles I could easily understand how the biochemistry of the bay leaf easily fits one of the most "cliché" myths for toxic plants to be taken as extremely dangerous, being actually FALSE. In several articles I have researched I couldn't find a single mention to the strong toxicity of bay leaves. What happens with the bay leaves is that the presence of an excess of reactive oxygen species (ROS) (chemically-reactive molecules containing oxygen) that appear as a result of natural metabolic processes, as stated in a paragraph that I quote: "Exogenous chemical and endogenous metabolic processes in the human body or in food system might produce highly reactive free radicals, especially oxygen derived radicals, which are capable of oxidizing biomolecules, resulting in cell death tissue damage". This has been proven to be caused by certain flavonoids present in the bay leaf composition, that ultimately may end up causing apoptosis (programmed cell death), but can only a few leaves cause such damage? As it reads in one of the articles I checked "Oxidative damage plays a significantly pathological role in human disease. Cancer, emphysema, cirrhosis, arteriosclerosis, and arthritis have all been correlated with oxidative damage. Also, excessive generation of ROS, which is induced by various stimuli and exceeds the antioxidant capacity of the organism, leads to a variety of pathophysiological processes such as inflammation, diabetes, genotoxicity and cancer." So, long story short, we have hexane and ethyl acetate present in Bay leaf that are responsible for potent biological activity causing apoptosis. The presence of sesquiterpene lactone in bay leaf, a class of chemical found in many plants that can cause allergic reactions and toxicity IF OVERDOSED, particularly in grazing livestock, demonstrates that our cooking plant as lived under wrong premises of a potential toxicity that actually depends on overdosing from whoever ingests it. So, the next step is to get to know the LD50 (median lethal dose) of this plant. In Fang et al., 2005; the dried residues of three bay leaf extracts were bioassayed to reveal a LD50 of 10µg/ml, i.e., 10 milligrams per litre!!!!!!! And this value concerns the extract (already refined and purified to obtain only the interesting part, and not the whole leaf components). So, where is this idea of bay leaf being really toxic is coming from? 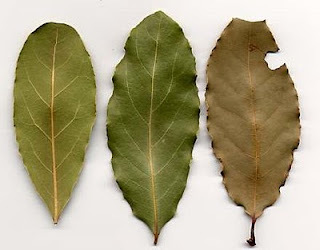 The misconception regarding bay leaf's toxicity comes from the fact that bay leaf plant is usually confused with Mountain Laurel (Kalmia Latifolia), related to bay leaf but different. It is actually Mountain Laurel (next image), as well as Cherry Laurel, that represent danger to humans and certain livestock and is just not sold anywhere as a spice, herb or food source. "Bay leaves and their essential oil do not appear to have any significant toxicity. However, sporadic reports have indicated that bay leaves may cause allergic contact dermatitis (Asakawa et al. 1974; Cheminat et al. 1984; Goncalo and Goncalo 1991) perhaps induced by one or more sesquiterpene lactone". Bay leaves aren't only good for adding that speacial flavour to your food. The fact that they hold several sesquiterpene lactones reacting with vernolic acid make it responsible for reducing inflammantion and improving the celular structure of smooth muscle of blood vessels, which can help prevent atherosclerosis. Bay leaf is even awesome on treating bronchial infections, and also used, if adequately applied to, as proper active medicinal tools on the treatment of gastrointestinal problems (flatulence, epigastric bloating, impaired digestion, eructation). In Turkey, popular medicine dictates that an infusion of bay leaves can help smooth hemorroids and rheumatism, work fine as a diuretic and prevents urinary stones. To make it short, you would need a huge amount of bay leaves in your food to get an overdose or an allergic/toxic reaction from your organism. So keep on adding it adequately to your food as it may be eaten without toxic effect. I tried English Laurel but used only one leaf per half gallon water in tea kettle cooking on low heat for 20 minutes. It works wonders, made me relaxed and my hip pain went away. I feel much more limber now. Bay leaves are quite stiff. If eaten in large pieces, cuts can occur. It is normal that for a person with a certain health issue a bay leaf infusion would cause problems. However, for everyone else who fortunately has no pancreatitis or some complication of the kind, it is not at all expected that complications or flare ups to emerge. I've always used bay leaf infusion to heal bronchitis; the leaves (at adequate doses) dry that mucus and speed up the healing process. Nonetheless, it is something that should not be used too frequently or for too long as the lungs get dry really fast. I would never advise someone with lung issues to try this because it could easily create serious problems. I understand that for someone with health issues, a certain leaf/remedy can be detrimental rather than positive. Thanks for sharing with us though, I hope you get well soon. I used extra bay leaves in my soup recently, and each bowl of soup I eat makes my face flush and I feel tired and ill. Did I use too many? NOTE: I have MS; could that be a factor in my reaction? Hi Danielle, thanks for visiting my blog. Well, your question is kind of tricky and please bear in mind that I am no medical doctor whatsoever. If you are concerned about your health it is always important to prompt it to your GP. However, I will read a little more about your situation and offer you my opinion on the accounts of someone interested in the matter. Give me some time and I'll get back to you through this very same post. Cheers! Thanks for your comment Nicola. Well, I've used even three in a cup and never had any problems. Maybe that differs from person to person. I'll read the link provided as soon as I have some free time, thanks! isn't 10 ug/mL actually 10 mg/L (not 10 grams/L)! Is it 10 ug/L (micrograms/Liter) or 10 mg/L (milligrams/Liter)? The difference is massively significant. It has been corrected. Thanks for letting me know of such typo, it is BAD to do it. hi,, i'm from Indonesia.. To accomplish my undergraduate study in Universitas Gadjah Mada, Indonesia i having research about micro encapsulation of Indonesia bay leaf (Syzygium polyanthum) essential oil with fish gelatin (and this product will be used as food flavoring in cuisine).. The problem was, there's no any industry that produce this essential oil from Syzygium polyanthun.. so my partner and i decided to buy this essential oil from India (with different genus: Pimenta ricemosa). But i don't know exactly is there any similarity of aromatic compound and toxicity from Indian bay leaf and Indonesian bay leaf.. from what i found, it said that Pimenta ricemosa essential oil is toxic.. and i dont now about indonesian essential oil yet. How do you think?is it okay if I use Pimenta ricemosa essential oil as flavoring in cuisine?can you give me any advice? Also, very quickly I was able to find this other url: http://www.aromaweb.com/essential-oils/bay-oil.asp where the bay essential oil of Pimenta racemosa is shortly assessed with a few references to articles in books available. I hope this information helped you and just in case you need some extra help, please, keep in touch! I would never use essential oils for cooking food. Only for aroma therapy and external healing purposes. For cooking I recommend to you to find Bay or Laurel plants nearby or sold in pots in hardware stores and to use only one leaf per meal to flavor food. Those are medicinal and heal arthritis, high blood pressure and have sedative effect. 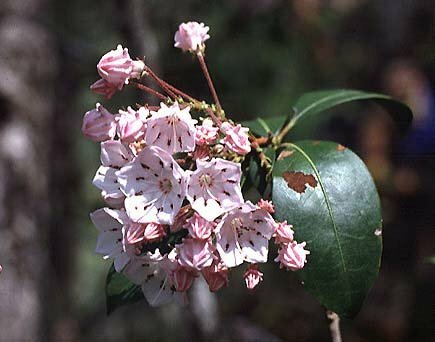 The USDA website says that Mountain Laurel is not toxic, very weird. "Flavor: Laurel water, which is made from the distillation of the tree's leaves, is often used as an almond flavoring. Dye: The tree's leaves and fruit can be heated to produce a dye for fabrics. Medicine: English Laurel leaves are often used as a sedative. In addition, the leaves are used in the treatment of coughs, asthma and indigestion. Floral Arrangements: The tree's flowers are prized by florists for their fragrance and beauty. In addition, English Laurel leaves are often added to floral arrangements to add volume. The English Laurel is especially popular in Europe where it has been grown as an ornamental hedge for more than 400 years"
Also thought I'd share a link to this great read on eating the nuts of California bay trees in the fall. Apparently they give you a caffeine like high, and also can be substituted for Coca beans to make an Bay chocolate. I started reading about Bay Tree toxicity when an old lady told me the wild bay trees in California were toxic. Alarmed, my research led me to your informative article, thanks for the hard work! Now, armed with the proper pictures to identify California Bay Trees from the toxic Mountain and Cherry Laurel, I'm on my way to Bay chocolate and nuts! Thanks you are so correct! I will put this change in for the next PLANTS update scheduled for late spring/early summer. Cheers, Gerry "
This plant is listed as have no Toxicity on your website. It's very toxic, so better change it before someone eats it. Russell, Alice B.; Hardin, James W.; Grand, Larry; Fraser, Angela. "Poisonous Plants: Kalmia latifolia". Poisonous Plants of North Carolina. North Carolina State University. Retrieved 2011 Oct 03.^ "Mountain Laurel". ASPCA. Retrieved 2011 Oct 03. " thank you so very much for being in touch. due to my wedding planning i could not review all the comments and participate as much as I wanted. I am really happy that you took some time to visit my blog and add to the discussion. Please keep visiting and helping in building sound knowledge. However, the last comment got me a tad confused as I believe you jumped a big part of the sequence of events. Is it possible for you to help me understand it a little better? Do you know if the berries of the California Bay Tree are toxic? We just got a new puppy and he seems to like eating them. I've been reading conflicting reports. USDA material said that birds and small mammals eat them, but on other websites it says they're toxic. Hello Sakib Hasan, thank you so very much for inviting me for an interview. I've been away for a while and not posting as much as I wanted because recently had my first child. But now that he is nearly a month I am a little more available. Just email me whenever to mrxil@nottingham.ac.uk. Thank you so very much for visiting my blog. Cheers. Hello, i have also website about mediterranean bay leaves http://www.bayloil.com i would like to develope and share all my ideas.can you write about my website? Hello mod, as soon as I get to see your website I will definitely let my readers know! It will take some time though, as I am starting work right after my paternity leave and Christmas holidays. Good luck! @the outcasts - There are many foods, herbs and substances that are safe for humans and not dogs, especially puppies. This is also true of animals in the wild. Some animals or birds can eat things that might poison another animal. Vultures, for instance, can eat some toxic substances and after eating the substances they are excreted without any toxicity and the birds do not suffer any physical effects. Dogs can have certain medications that would kill a cat. Animals in the wild have better instinct for poisonous plants, etc. than do domesticated animals I think. It might be to your benefit to check out links that list foods and substances that are not fit for dogs. Hello Stanislava, I am a little overloaded with stuff to do in the lab but please keep visiting the blog in the coming two weeks and I will try my best to read though a lot of info I have on this issue. Then I will post here whatever I found that might be pertinent for your case. Bear in mind I am no GP so whatever information I pass you is the result of a curious mind reading about it. Cheers. Thanks a lot, I really appriciatte your interest :) :) Good luck in your lab! S.
In response to Stanislava Zemlickova: After a simple research through several pages on the internet I could find many people that domestically use Bay leave's syrup for coughing babies.Your recipe doses do differ slightly from other peoples' recipes, and one must always be careful when dealing with children and/or patients suffering from renal conditions and the like. Why don't you try something a little lighter to start with? Especially because as stated in the website HealthLine drugz A-Z "There is not enough scientific evidence to safely recommend bay leaf for use in children." And one has to take into account the allergy factor, thus by reducing the active principle you can reduce any potential dose of allergen. Here is a starting point for you, 1) make sure your child is not allergic to bay leaf, 2) try this tea first [http://www.food.com/recipe/baby-gripe-water-great-for-adults-too-aka-bay-leaf-tea-224686] and only then try this syrup [http://www.alternativemedica.com/2013/02/bay-leaf-syrup-for-soothing-cough.html]. The amount of sugar in your recipe is scary, honestly, I think that would be a lot more harmful than anything else. Because the tested syrup I am linking you to uses less of everything you do for the same volume of liquid. In 250 ml they use 6 bay leaves where you want to use 15, they use 1 lemon where you want to use 250 ml of lemon juice (of how many lemons?? that's another important thing), and they use 6 Muscovado sugar teaspoons where you want to use 500g!!! It seems to me that it would end hyper concentrated and could result in some mild shock! Try the lighter tea version, then progress to the lighter syrup version and if none work I wouldn't advise your recipe but a medical follow-up. Hope it helps! First, thanks for your respond. Thank you very much and all the best! I would like to pose a question of a different focus regarding bay leaf. Your article, questions and comments all focus on the leaf. But what about the toxicology of burning bay leaf wood as a source of fuel? The burning of certain tree woods are more toxic than others. One specie of tree, for example, is so toxic that the inhalation, ingestion or touch poses a health risk. Hello there! Thanks for this interesting article. It's so good that someone's has cleared up this pseudo-myth on a scientific basis. There's so often confusion about the uses and safety of herbs. I also heard the bay seeds to be poisonous. Do you think it's true?. One even sais that it's unsafe to crush or press the berries to obtain the fixed oil. I could only find one single reference about the LD50 value of an oily extract of the berries. http://www.ncbi.nlm.nih.gov/pubmed/9323999# Do you think this relevant? Dear Victoria, The days go by and I am ever more mesmerised to why this bay leaf topic collected so many fans! Wonderful I'd say. I will need a few weeks to clarify your questions on a scientific ground, but the moment I have the right answers I'll post them here for all of you to read. Thanks for visiting the blog. Cheers. let me remind you that I am not a GP. My advise is based on knowledge obtained from science articles. I have a masters by research in Toxicology and I am just finishing my PhD in Molecular Microbiology. If you are battling with any form of health issue, visiting a doctor is always the best option. However, I can immediately tell you that boiling 5 bay leaves for a tea (even though you do not advance us the volume of water in which you put the leaves), looks like a lot!!!!! Especially when you let it sit overnight. Personally, when I used to brew some bay leaf tea I used to do it with one single leaf for a volume of approximately 500 mL. I will look into bay leaf infusions and benefits for arthritis, "salt deposits from joints on bunions" (as you put it). My advise is until you actually get to see a doctor or clarify the best way to use a bay leaf infusion with the health issues you may have, do not drink your preparation. It looks to me way too concentrated. Talk to you soon, keep visiting the blog, cheers! I've heard that Bay leaves can be burned and used to calming someone who has anxiety or fatigue. Do you know of this and what about people who are bipolar? I'm interested in knowing more about burning Bay leaves to relieve anxiety and fatigue. In regards to your specifics, I will need some time to do a proper research, but keep on visiting the blog or drop me an email with your email address, and I will let you know when I managed to post about it. Is there any benefit using Bay Leaf in the treatment for COPD? I'm looking for help with this. I have a huge bag of bay leaves in my cupboard at all times. I grew up using them. Whenever I make a big pot of homemade vegetable soup I float 2 or 3 bay leaves on top while it simmers for hours. I use crushed bay leaves to keep ants out of the kitchen. I make a tea like infusion with them and spray my cats bedding and scratching post etc to keep fleas away. I put orange peels, cinnamon stick, cloves and bay leaves in a pan of water and let it simmer low all day to make the house smell Heavenly. I also prefer to smudge using bay leaves and rosemary. I find it a versatile leaf. Have you seen the meme on Facebook about the "benefits" of burning bay leaves. Is it myth or fact? I have COPD , would it be safe for me to burn bay leaves or get the oil and massage into chest to ease breathing ?? Dear Judy, I have been a bit tight on time but I promise to respond to the latest bay leaf questions in the coming two weeks. Thank you so much for your patience. Keep visiting the blog for more news. Hi Katherine, I haven't forgotten your question, I am today focusing on answering all of your queries. @ Anonymous: Unfortunately I do not know exactly what meme you're talking about. Can you be a nit more specific? Cheers. I'm interested in the bay leaf for type 2 diabetes. What is the best way to consume this for maximum benefits? Hello anonymous, this and other questions will be answered to the best of my knowledge in future articles. Stay tuned and thanks for visiting The Toxicologist Today. When cooking are you only using dried bay leaves or are fresh leaves used? Are only dry bay leaves used in cooking or can you also use fresh leaves? if your burn a bay leaf are the fumes toxic to cats ? I have not forgotten your question, but only this week have I found some similar questions that can build up a nice post, so stay tuned as I'll reply sooner than later. Hello, Kindly guide how to use bay leaves for curing bunions. Hi anonymous, I will have to research and then I'll post whatever scientific findings I may make. Stay tuned for future posts. Wow, that's definitely something new I had never heard about. Allow me some time so I can research on the matter, ..., that got me super curious. My girlfriend is planning to start a regimen of ingesting bay Laurel oil for cardiovascular health. It sounds like this isn't an issue as long as she isn't allergic? Bear with me for a few days so I can research on the matter properly so to provide you with the most up-to-date information I personally can find. Just a disclaimer, please, that I do not provide any advice on medical treatments and that my sole purpose with this blog is to inform readers of the existing scientific documents covering their scientific questions. Any underlying medical issues MUST be addressed to/by a physician/pharmacist/medical doctor, OK? Will post something on this topic later on this week. P.s. it's actually not the essential oil she is going to take, but a bay leaf tea. I have finches in my house. If I burn bay leaf for my own detox reasons (I get an allergy shoveling the snow which has some chemicals in it), will the bay leaf harm my birds? Thank you. I am 75 years old and have recently tried smoking crushed dried bay leaves in a vape to see if the plant's storied calming effects can be obtained through this method. Answer: they can. I experience a mild feeling of relaxation and well being. Question: Is it harmful to my body to inhale this vapor? I hope this information may be of help, but get back to me if something more specific is required. What about the toxicology of burning bay leaf wood as a source of fuel? A new GHS for hazardous chemicals. Did you know? The Global Measles Epidemic Isn’t (Just) About Measles - Strong health systems, along with immunization efforts, are key to fighting disease around the world.